Opportunity for food hub operators (locally-sourced meats, fruits, and vegetables): retail and wholesale distributors; value-added processors and producers; and food business incubators. 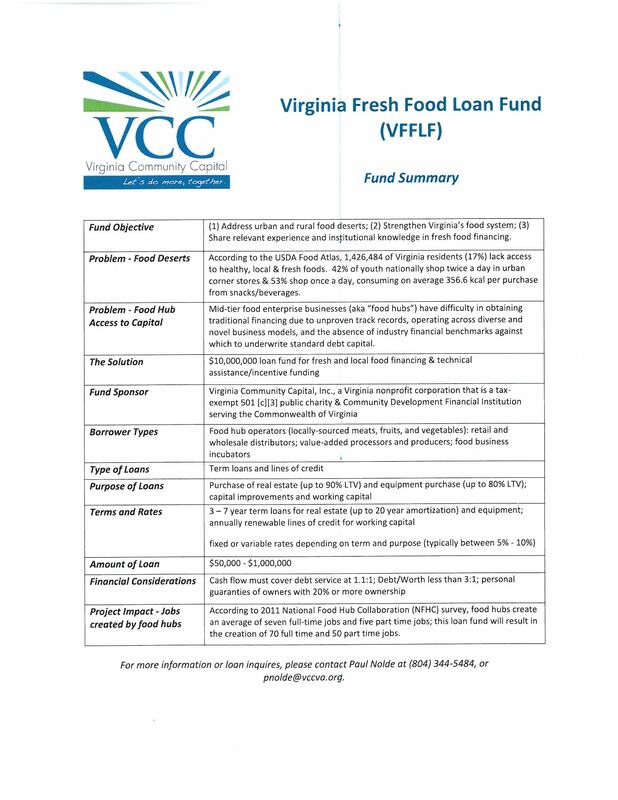 Below you will find a summary of the Virginia Fresh Food Loan Fund (VFFLF) which aims to address food deserts and strengthen Virginia’s food system by sharing relevant experience and institutional knowledge in fresh food financing. For more on Virginia Community Capital, check out their site. HURRY: APPLICATIONS DUE MARCH 31!!! Did you know that over half of all beginning farm businesses fail within the first 5 years of operation? Ellwood Thompsons (ET) Produce Educator-Heather DeMascio and Virginia State University College of Agriculture (VSU-COA) Cooperative Extension-Dr. Theresa Nartea are teaming together to make a positive change in increasing the success rate for Virginia beginning farm businesses. VSU-COA and ET are working together to develop an ET Food Hub model targeted at priority purchasing from minority and women farmers who have owned and operated their farm for less than five years and who farm within a 100 mile driving distance from the ET store located at 4 N Thompson St, Richmond, VA 23221. Through an unique partnership with VSU-COA, selected farmer applicants will receive educational training to successfully sell directly to ET and develop their diversified marketing strategy to ensure continuing business success.